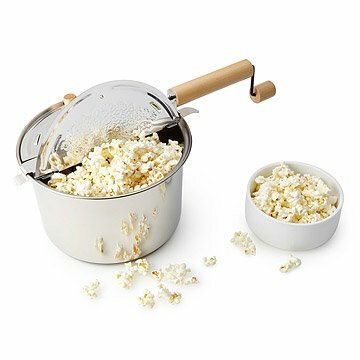 This durable popper makes perfect popcorn on your stovetop. Whip up the classic, crisp companion to movie night with this durable popcorn popper. Whatever your stovetop--gas, electric, or infrared burner--the heavy-duty popper makes 6 full quarts of fluffy popcorn (approx. 24 cups popped corn) with its patented stirring mechanism and stainless steel components designed to handle the wear and tear of high temperature popping. The encapsulated carbon steel disc on the bottom of the pan ensures a perfect batch of popcorn every time. The natural hardwood handle stays cool and keeps your hands away from the heat and steam, while the removable lid with quick-release clips makes for easy cleanup after the credits roll. Made in China. Pair your Outdoor Popcorn Popper with our Popcorn Kernel and Seasoning Sets and Organic Popcorn Kit. Hand wash Do not place in dish washer or microwave. This item has become a family tradition. A majority of my very large extended family has this. (The secret is to shake up the freshly cooked popcorn with melted butter, salt, or sugar in a paper grocery bag and shake.) Even day after popcorn is perfect. I had to make a comment because I hope others will purchase and keep the fun going. Oh, the plastic gears finally failed on my father's after about 20 years of being used a lot! As good as theater popcorn! This popcorn maker was a gift for my popcorn-loving husband. However, he uses it almost daily for our entire family. The product is easy to use and the popcorn tastes as close to movie theater popcorn as you can get without driving to the theater. I am extremely pleased with my purchase and hope we can enjoy it for years to come! He's been making popcorn on the stove the traditional way in my good sauce pan and it's tastes way better than microwave popcorn. Now he has a pan specifically designed for making popcorn, which we love to have when watching movies at home. This pan is perfectly designed and has a nice heavy bottom so the corn cooks quickly and evenly. The pan holds a lot so we can both have generous servings. He loved getting it and loves using it. Great Popper! Easy to Clean, Easy to Use. I had a plug in popcorn maker and it was so hard to clean. You couldn't get the grease off the plastic. This popper has a sturdy base that's easy to clean and the lid, although a tad intricate, can be cleaned easily as well. Much healthier than microwave popcorn too, tastes great and cooks quickly. My husband is a popcorn lover and this gift was perfect for him. The product come with a instructions and he enjoyed how could he be creative. I also brought a savory popcorn kernels seasoning set. It does a beautiful popcorn with a regular popcorn too. The only issue that he had was the fact that the base of the pan stinks the oil and its kind of hard to clean, and handle of the pan is attached to the lid, not to the pan itself.